Categories of products: The applicable products such as Large Aeroplanes, Engines, Small Rotorcraft, Sailplanes, etc. Relevant section of AMC & GM document: Subpart J - Design Organisation Approval. This legislation is updated regularly by issuing amendments. A full overview can be found on the Regulations page. This process will be further explained during a kick-off meeting organised by the DOA Team Leader. After the issue of DOA Certificate, significant changes to the Design Organisation must be approved by the Agency, by submitting an application form (FO.DOA.00082 under “Downloads” on the right). In accordance with Commission Regulation (EC) 319/2014, the Agency levies fees and charges for all its certification and approvals activities. Relevant sections for DOA can be found in the Annex, Table 7A of Part I and items (8) and (9) of Part V - Explanatory Note. 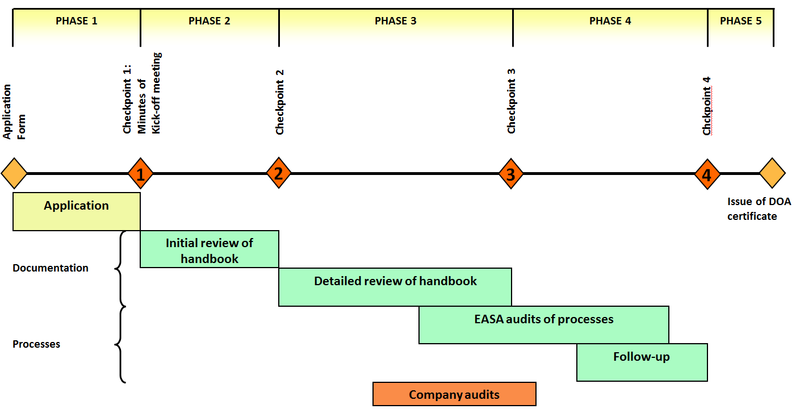 EASA Good Practices intend to clarify specific items of implementing rules for design organisation approvals. They highlight a particular subject and, as non-binding material, provide additional technical explanations to current standards. EASA Good Practices are published for information purposes only and must not be regarded as formally adopted Acceptable Means of Compliance (AMC) or Guidance Material (GM). EASA Good Practices do not introduce new or modified rules and do not constitute any legal obligation or right for the Agency or the organisations.